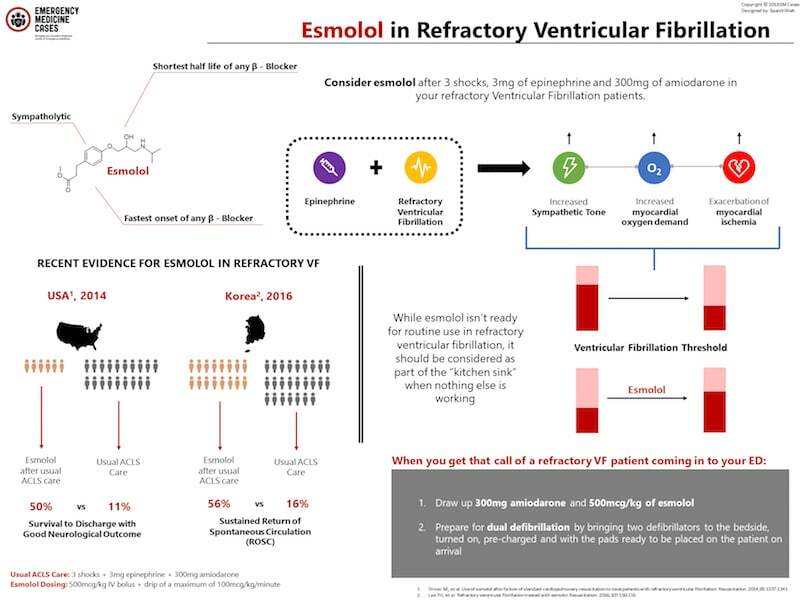 Why esmolol for refractory Ventricular Fibrillation? In refractory Ventricular Fibrillation there is a huge increase in sympathetic tone at least partially due to the epinephrine given, which results in increased myocardial oxygen demand, exacerbation of myocardial ischemia, and depression of the VF threshold. Esmolol is the perfect sympatholytic and it increases the fibrillation threshold. It has the fastest onset and shortest half-life of any B-blocker. What is the evidence for esmolol for refractory Ventricular Fibrillation? The evidence for esmolol in refractory Ventricular Fibrillation isn’t the greatest – no big RCTs to be certain. There are a handful of older small studies looking at other B-blockers in cardiac arrest that looked promising, but these were done in an era of cardiac arrest management that is now considered archaic. 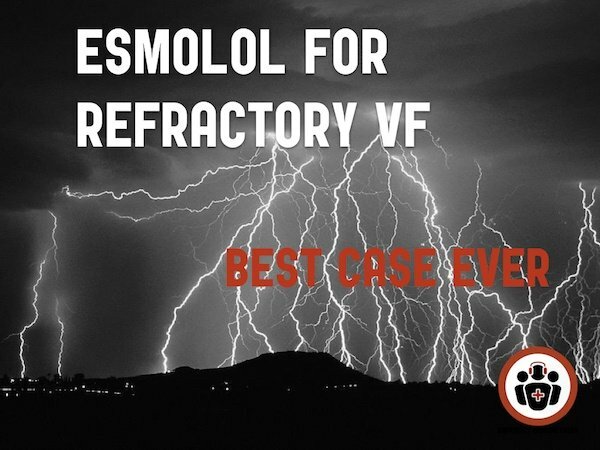 The evidence we have for esmolol in refractory VF in particular comes from 2 more recent studies performed in the latest era of ACLS management. ustained ROSC. And here’s the amazing part – survival to discharge with a good neurologic outcome was 50% in the esmolol group vs 11% in the control group. Tiny study with impressive results. Then in 2016 there was another retrospective study of out of hospital cardiac arrests in Korea comparing 16 patients who got esmolol to 25 patients who didn’t. They used the same dosing of esmolol as the previous study, again after usual ACLS care – 3 shocks, 3mg of epinephrine and 300mg amiodarone – and they found similar outcomes: improved rates of ROSC and survival to the ICU. So while we’re waiting for some bigger multicentre RCTs, for now, consider esmolol after 3 shocks, 3mg of epi and 300mg of amiodarone in your refractory Ventrcular Fibrillation patients. While esmolol isn’t ready for routine use in this setting, it should be considered as part of the “kitchen sink” when nothing else is working. When you get that call patched in of a refractory VF patient coming in to your ED, premix 300mg of amiodorane, 500micrograms/kg of esmolol and prepare for dual defibrillation by bringing two defibrillators to the bedside, turned on, pre-charged and with the pads ready to be placed on the patient on arrival. If all that doesn’t work there’s always the old ultrasound guided stellate ganglion block that will take out sympathetic drive to the heart – I know, sounds like kind of a crazy move – but again, you ain’t got nothin’ to lose. Driver BE, Debaty G, Plummer DW, Smith SW. Use of esmolol after failure of standard cardiopulmonary resuscitation to treat patients with refractory ventricular fibrillation. Resuscitation. 2014;85:1337-1341. Lee YH, et al. Refractory ventricular fibrillation treated with esmolol. Resuscitation. 2016;107:150-155.
de Oliveira FC, Feitosa-Filho GS, Ritt LE. Use of beta-blockers for the treatment of cardiac arrest due to ventricular fibrillation/pulseless ventricular tachycardia: a systematic review. Resuscitation. 2012;83:674-83. Meng L, Tseng CH, Shivkumar K, Ajijola O. Efficacy of Stellate Ganglion Blockade in Managing Electrical Storm: A Systematic Review. JACC Clin Electrophysiol. 2017;3(9):942-949.